A flash drive is a drive using flash memory. Flash drives are the larger memory modules consisting of a number of flash chips. A flash chip is used to read the contents of a single cell, but it can write entire block of cells. If you come to this article, you may have encountered a data loss or damage in your Flash Drive. The data loss is an unexpected thing happen sometimes and somewhere. A man becomes learned by asking questions---- How can we recover the deleted file in Flash Drive? In this CMD COMMANDER operation, the H can be replaced with the drive letter of the USB drive. The Windows will try to recover your files, but it is not always workable every time. Furthermore, if you have the backup in windows, you can right-click the flash drive icon and do the recover to former file status order directly. 2. Are you tired of CMD? Ease and Safe way to retrieve deleted files from Flash drive with a recovery software! We'll introduce the best flash drive recovery software to help you restore deleted or lost data from USB flash drive successfully. It supports the brand: Kingston, Toshiba, SanDisk, PNY, Sony, etc. Frankly speaking, it's easy to lose/delete data from the flash drive, especially when data has not been backed up. At that time, we can't find the data in Recycle Bin, because flash drive is different from the hard drive, it does not have its Recycle Bin, and if you delete a file from the flash drive, it is equivalent to using Shift + delete to permanently deleted the data on a computer. How to undelete files from a flash drive? Recover permanently deleted issues can be solved by using a professional USB data recovery software. You can try to use Bitwar Data Recovery software to undelete files from flash drive. It is a full version data recovery software to recover deleted, formatted or inaccessible data from Windows PC, laptop, hard drive, SSD, memory card, USB flash drive, SD card, digital camera, multimedia player and other storage devices. Guides of recovering undeleted files from flash drive. 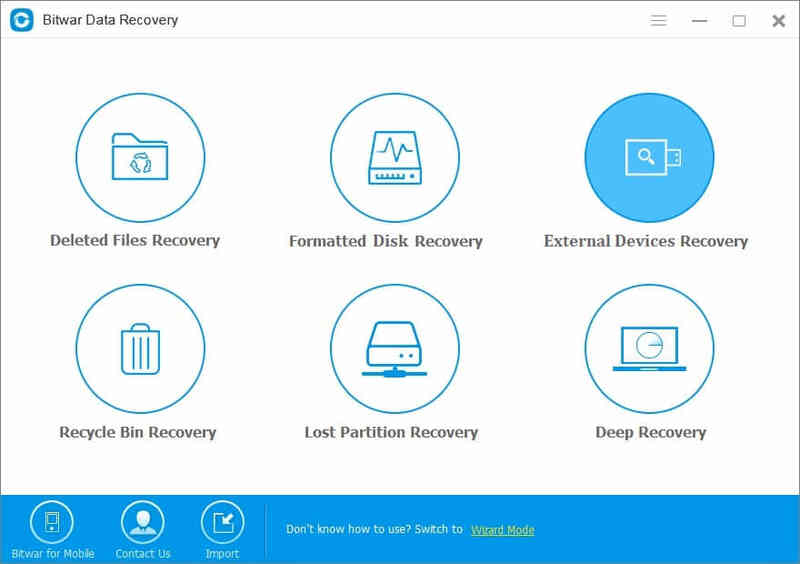 You can free download and install Bitwar Data Recovery Software on your computer by clicking the download button below. Step 2: To undelete files from the flash drive, please select "External Devices Recovery" recovery mode. Tips: Make sure your USB flash drive has connected to your computer. The Bitwar Data Recovery software supports recovering all type of data, including pictures, videos, audio, documents, and other files. Step 3: Finally, click on the "Next" button to start scanning the USB flash drive. During the scanning process, you can pause your recovery progress temporarily to preview and recover scanned files and continue later, until you find all the missing data. Step 4: After the scan is complete, you can make a selection with Preview data to determine which file you want. 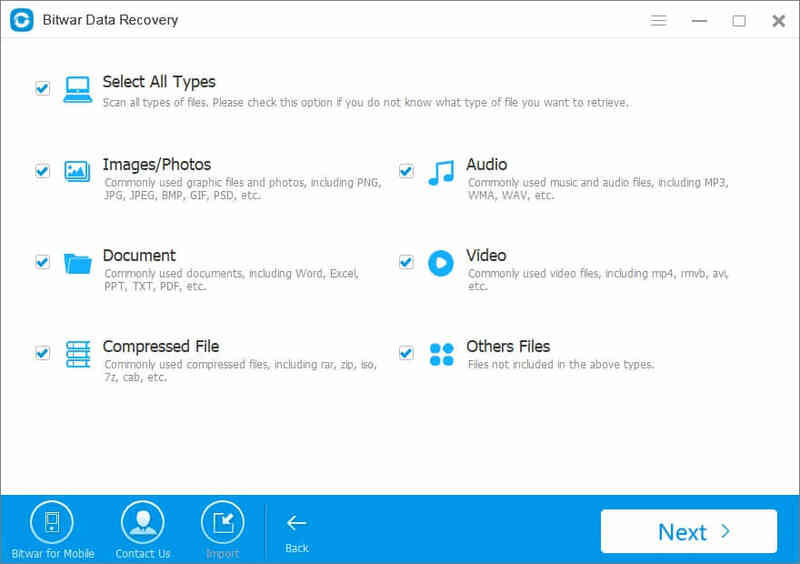 "Recover" button to save all your restored files to your computer. Here you should select a safe folder on your computer or other external devices to keep them. By the way, Bitwar Data Recovery also supports hard disk data recovery, memory card data recovery, CF card data recovery, external hard drive data recovery, memory sticks data recovery, etc.